So how was your week? Mine was good, but I sure am ready for my weekend! We are still working on the master bathroom...it's a slow process when you don't know what you're doing! lol! Hopefully this weekend we can finish it. 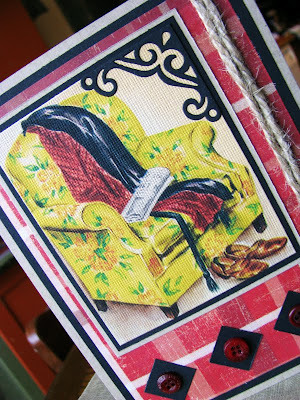 Today's card is made using one of Peggy's freebie images from over on her blog, Peggy Loves Vintage. She always has the best stories and the best freebies over there. Check her out HERE! 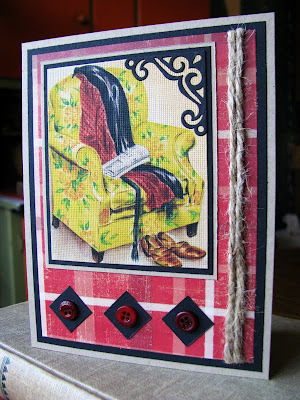 When I saw this image I just adored it and had to make a card right away! I love the colors and just look at the fabric on that chair! Coolness! Since its a guy card, I wanted to use guy-ish embellishments. I cut 3 little squares and then turned them to make a diamond shape, then topped them with a red button. I also added the scroll-y corner to the image. 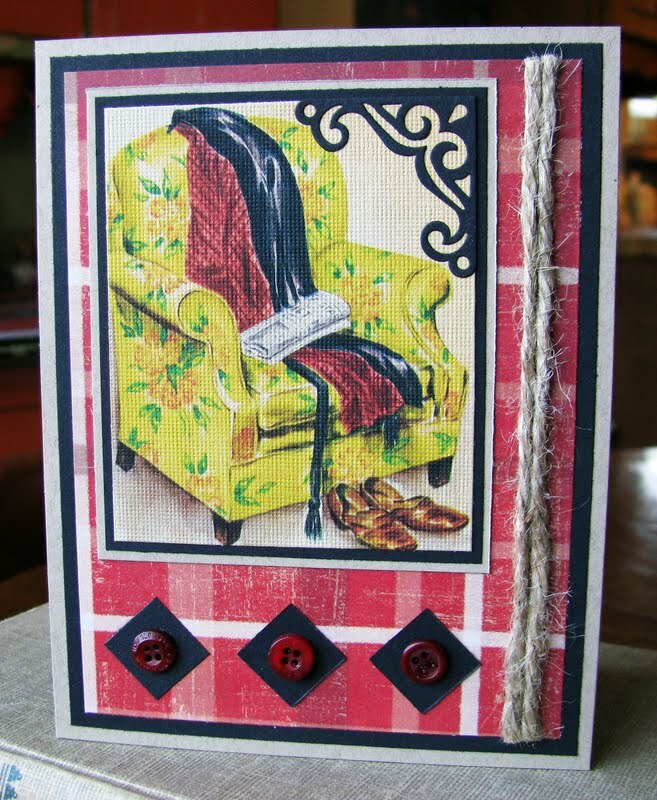 It's a cuddlebug die that always works well for guy cards too. 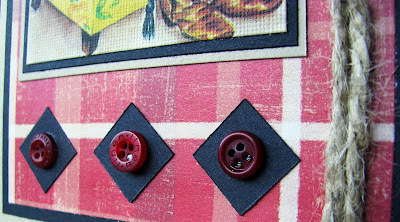 Lastly I added a couple of strands of jute...another one of my favorite guy embellies! Well that's all for today! Thanks for dropping by to see me and my card! I hope you've enjoyed it! Please be sure to visit Peggy and grab your freebies! Until next time, have a lovely day! HUGS! Fabulous card with the chair, DeeDee!! Love the way you did the buttons inside the squares. Awesome paper and design! I love it! hugs!! !